I’m talking about Arya’s stabbing during the last show. First, I don’t think she’s going to die. I say that because they’re not going to draw something like that out across two shows. Having said that, I’ve heard a theory that goes something like this: It wasn’t Arya that got stabbed, it was actually Jaqen H’ghar in disguise! Why? Because Arya named him as someone that he has to kill, and he never took the third life (this goes back a season or two) that he promised… therefore, he’s fulfilling his promise. Or something like that. I don’t like this theory. Arya told Jaqen at the time that he wouldn’t have to kill himself if he helped her escape, and he did that. She did not, however, ever name the third person to kill. What I think is going on is this – Arya was sent on the mission to kill the actress and didn’t… I believe this was all part of her training – that she shouldn’t kill someone that didn’t do anything wrong. Jaqen is also testing the Waif who, you’ll note, didn’t make it “quick” the way Jaqen suggested. With Arya staggering through town, Jaqen is probably nearby watching. At some point Arya, the Waif and Jaqen will all be together… and Arya will get her final requested kill: The Waif. At this point, Jaqen will kill the Waif, save Arya and tell her this is all part of her training. The reason I think this is part of her training is that they’d never send her out into the world to kill people without having to be able to deal with being attacked in some way. Anyway, I think this is at least partially plausible. I still think that “third kill” is in play (I really don’t recall if Jaqen killed that person for Arya or not), and that’ll be the Waif. 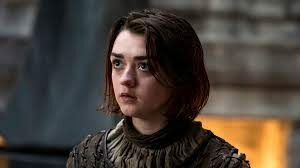 Of course, that could happen and then Arya could get saved and still be on the run with a death sentence on her head… That’s probably more likely, since it would be much more dramatic for the show. Not sure I like that happening though. Arya would have to be constantly looking over her shoulder. And if that happens, I’d be surprised if she survived to the finale and beyond, because the Faceless Men will catch up to her. Tell me in the comments what I missed… I’m sure I missed something! Previous Previous post: Tyrion Targaryen?